This week in drama* on the waterfront, we learn more about writer, doctor and spiritualist, and author of The Hound of the Baskervilles, Sir Arthur Conan Doyle. 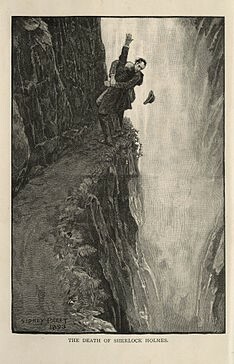 An Old Norfolk Saying... "And a dreadful thing from the cliff did spring, And its wild bark thrill'd around, His eyes had the glow of the fires below, Twas the form of the Spectre Hound"
Author Arthur Conan Doyle wrote 60 mystery stories with Sherlock Holmes and his loyal assistant Watson. He dreamed of being a serious historical novelist, yet he is best remembered for stories that he considered pot-boilers. 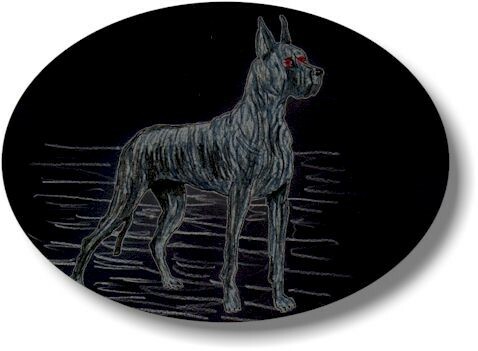 He drew on many sources for his stories, and it was during a visit to Sheringham, Norfolk that he learned of the hound, Black Shuck, who is said to be one of the oldest phantoms of Great Britain which inspired him to write The Hound of the Baskervilles. There are many myths, tales, legends and sightings of this monster. Local legend tells of a huge hound, the size of a small calf with blazing eyes, who regularly prowls the coastal path between Sheringham and Overstrand. The beast is said to track the steps of its victim and anyone unfortunate enough to turn around and meet its fiery gaze is said to die within a twelve month period. The Baskerville name was apparently from a local coach driver, Henry Baskerville, whom Doyle came across during his visit. The old man kept a signed copy of the book's original pressing as a sort of recompense. 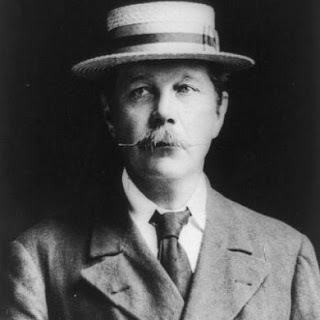 Conan Doyle was born in Scotland. When he was nine years old he was sent off to England to a Jesuit Boarding school. It was here he found his flair for storytelling as a way of escape from bullying. When he left school he decided to pursue a medical degree at the University of Edinburgh. At medical school, he met his mentor, Professor Dr. Joseph Bell, whose keen powers of observation would later inspire him to create his famed, legendary master sleuth, Sherlock Holmes. Doyle’s first publication came in 1879 with The Mystery of Sasassa Valley. At the same time as writing, he pursued his studies and went on to become a physician at Southsea, Portsmouth. He eventually gave up medicine to concentrate on his writing career. In a series of stories - starting with A Study in Scarlet and The Sign of the Four - he produced the memorable character, Sherlock Holmes, a detective who relied on facts and evidence rather than chance. In 1891, six Adventures of Sherlock Holmes were published in Strand magazine, with six more appearing the next year. By 1893, The Memoirs of Sherlock Holmes, as the collected stories were now called, was a huge hit. Doyle however, wanted to concentrate on a more serious writing career and as he was somewhat tired of Sherlock Holmes he decided to kill him off. As a result he wrote The Adventure of the Final Problem, in which Holmes and his arch enemy, Moriarty find themselves at the end of an intense pursuit, up on the top of the Reichenbach Falls in the Swiss Alps. This encounter ends with both of them apparently falling to their deaths. Homes and Moriarty firghting at the Reichenbach Falls. Illustration by Sidney Paget. However, due to public outrage and financial pressures he was compelled to continue writing the Sherlock Holmes stories. The first to follow on from The Adventure of the Final Problem was The Hound of the Baskervilles, which remains today one of the most famous and popular of the Sherlock Holmes stories. 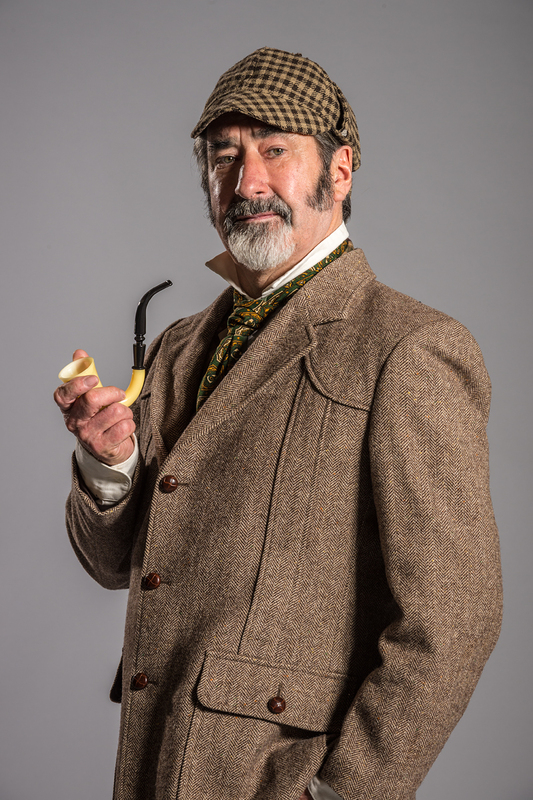 William Kircher as Sherlock Holmes in the current Circa production of The Hound of the Baskervilles. Around the time he obtained his medical degree, Conan Doyle’s renounced his Catholicism and turned away from organised religion. He began to attend séances and by the end of his life he had become an ardent spiritualist. On one level, his was the story of a lapsed Roman Catholic troubled by an alcoholic father and never quite able to cast off his sense of the supernatural; on another it was the intellectual journey of an inquisitive man, dissatisfied with Victorian materialism but intent on using its tools to examine alternative forms of consciousness. His brother died in WW1 and his son died of ‘flu during the great epidemic round the same time, thus adding to the fervor of his convictions. This was also a time when orthodox religion was giving way to Darwin and science. 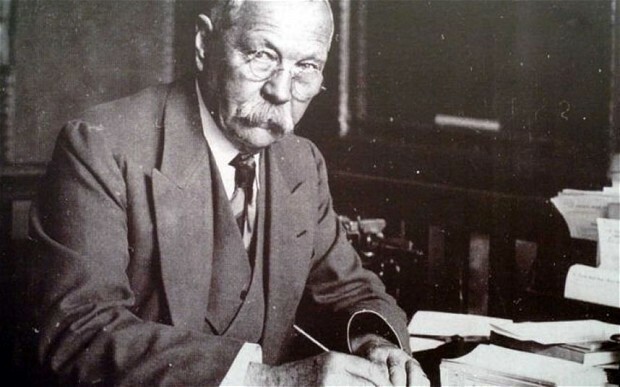 Conan Doyle died in Windlesham, his home in Crowborough, Sussex, and at his funeral his family and members of the spiritualist community celebrated rather than mourned the occasion. On July 13 1930, thousands of people filled London’s Royal Albert Hall for a séance during which Estelle Roberts, the spiritualist medium, claimed to have contacted Sir Arthur. In 1902, Arthur Conan Doyle was knighted by King Edward VII. It was not for having created Sherlock Holmes, but for his writing a non-fiction work about the Boer War. However, his legacy remains with the amazing Sherlock Holmes stories. The Hound of the Baskervilles is on at Circa Theatre until 29 August. Book online at www.circa.co.nz or by phone on 04 801 7992.